Here's some news from the Game Informer article that game out today about Mass Effect 3. The third game in the space trilogy starts with Commander Shepard present on planet Earth, seemingly on trial in regard to the events of The Arrival (available on DLC via your Xbox), and in the middle of the trial, the always evil Reapers invade the planet. The game's opening prologue involves Sheppard escaping to the Normandy ship, and off to start finding those allies, fighting Reaper troops (husks of all the different variant species) the whole way through. For squad mates it seems to be confirmed that we get Liara, Ashley/Kaiden, Garrus (if he's alive) and... James Sanders...confirmed to appear in game, but not guaranteed as squad members: Wrex, Mordin, Legion, and Anderson. Obviously, if they lived through the suicide mission that was Mass Effect 2 . 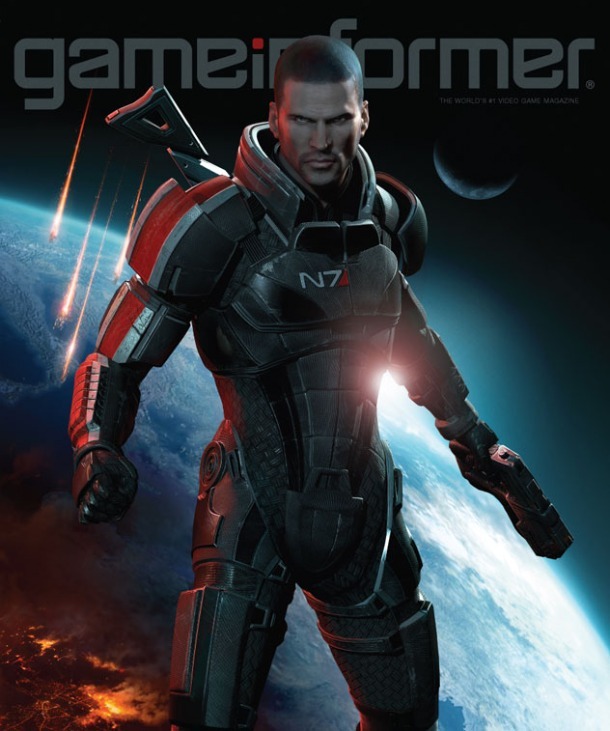 The game will feature a "previously on Mass Effect" comic to make decisions with if starting from scratch. This is like what was available for the Play Station version of the new version of ME2. The dangerous Illusive Man also plays a prominent role, and the dastardly Cerberus is out to kill Shepard. We are not yet in the know as to why. The familiar RPG elements are receiving change up. Larger skill trees and evolving powers offer players more freedom in Sheppard's character development. Weapons have a set list, like Mass Effect 2, but modifications are available. These include attaching new barrels, scopes and other add-ons to your weapon, boosting its performance and affecting its appearance. The good news is that any class can wield any weapon style. The only difference is that each class has limited slots to carry them. The solider, for example, is the only class that can carry all weapons at once. This is good news for those who like to use biotics but also what to weild the devasting sniper rifle! Mass Effect 3 will apparently have numerous endings, some good and some bad - like a twist-a-plot. Keen as? Order Mass Effect 3 from Amazon .